Middle meningeal arteriovenous fistulae are usually posttraumatic or iatrogenic in origin.,,, They exhibit multiple draining pathways and are usually treated successfully by endovascular embolization. Surgery remains an alternative method for treating these conditions. We report a case of middle meningeal arteriovenous fistula in a patient with a history of head trauma which was treated successfully using endovascular embolization. A 29-year old male patient met with an accident and had a brief loss of consciousness for which he was managed conservatively. He was discharged 24 hours later without any neurological deficits. Gradually, he developed right eye swelling and associated pain in the region over the period of 3 weeks. 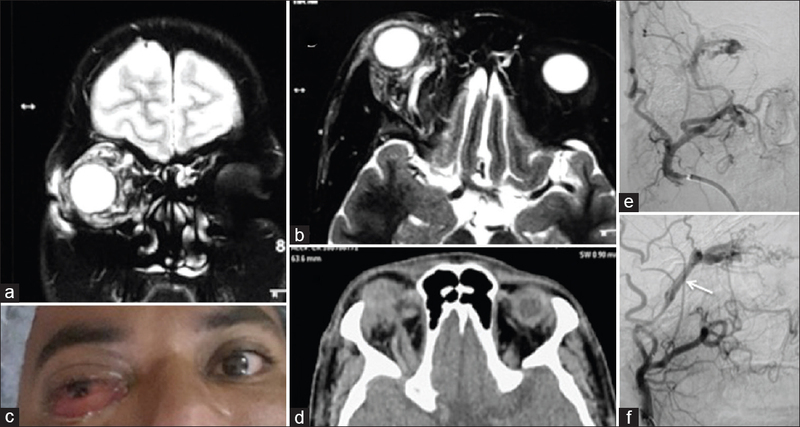 On examination, he was found to have right eye proptosis and extensive chemosis with complete absence of right eyeball movement [Figure 1]c. Magnetic resonance imaging (MRI) of the brain and orbits was done which showed a prominent dural vessel along the right temporal region extending towards the orbital apex with dilated tortuous intraorbital vascular channels [Figure 1]a, [Figure 1]b and [Figure 1]d. The possibility of dural arteriovenous fistula was made on the basis of MRI, and a diagnostic digital subtraction angiography (DSA) was performed. The right internal carotid artery (ICA) angiogram was normal. 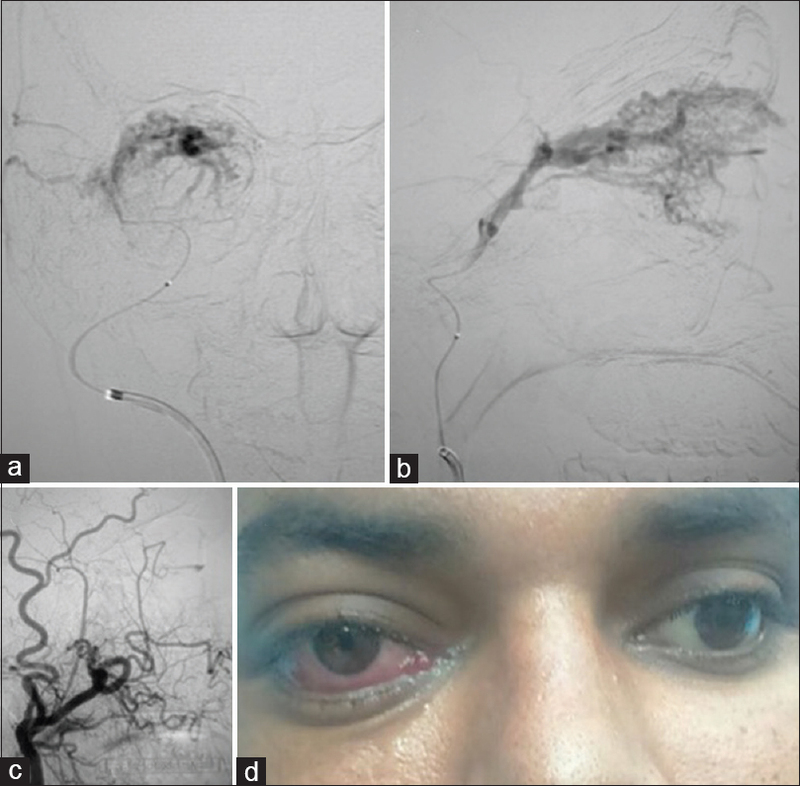 The right external carotid artery (ECA) angiogram showed the presence of a fistula between the right middle meningeal artery (MMA) and middle meningeal vein draining into the dilated tortuous superior ophthalmic vein with multiple other tortuous dilated intraorbital veins [Figure 1]e and [Figure 1]f. A distinct “tram track” appearance, which is a specific sign to suggest the presence of a middle meningeal arteriovenous fistula, was well appreciable in our case [[Figure 1]f, arrow]. Thus, a single posttraumatic middle meningeal arteriovenous fistula was diagnosed and endovascular glue embolization was planned. Using the right femoral approach, a 6-F guiding catheter was directed into the right internal maxillary artery (IMA) and a 1.3-F microcatheter with a 0.014-inch microguidewire was subsequently passed through it. The microcatheter was advanced into the MMA and positioned just proximal to the fistula site and an angiogram was done [Figure 2]a and [Figure 2]b. After confirming the final position of the microcatheter, 0.5 ml of 33% glue diluted with lipiodol was injected, which occluded the fistula as well as part of the feeding artery and draining vein. The check angiogram through the guiding catheter confirmed complete embolization of the fistula [Figure 2]c. The procedure was uneventful and there was rapid improvement in the chemosis and proptosis [Figure 2]d. However, diplopia gradually improved over a period of 3–4 weeks. At a 5-month follow-up, the patient had complete recovery from his symptoms. The arteriovenous fistulae (AVFs) between dural arteries and the veins traversing parallel to the arteries virtually never develops unless arterial disease or direct trauma of the adjacent artery causes arterial rupture. Likewise, middle meningeal AVFs are uncommon lesions and are usually secondary to trauma or iatrogenic injuries.,, The fistula can communicate with any of the veins running parallel to it such as the middle meningeal vein, superior petrosal sinus, sphenoperietal sinus, diploic vein, or into a bridging cortical vein. Freckmann et al., reviewed angiograms in 446 patients with head trauma and found an arteriovenous fistula of the MMA in 8 (1.8%) patients. Based on the venous drainage, they classified the AVF of the MMA on angiography into six subtypes. Based upon this proposed classification, our case falls into the Freckmann type I category with a variation that retrograde ophthalmic vein congestion was present that gave rise to the presenting symptoms. The case highlights yet another rare vascular cause of unilateral proptosis and chemosis. Berenstein A, Lasjaunias P, Ter Brugge KG. Surgical Neuroangiography. Clinical and Endovascular Treatment Aspects in Adults. Vol. 2, 2nd edition. Springer-Verlag: Berlin, Heidelberg; 2002. Freckmann N, Sartor K, Herrmann HD. Traumatic arteriovenous fistulae of the middle meningeal artery and neighboring veins or dural sinuses. Acta Neurochir (Wien) 1981;55:273-81. Terada T, Nakai E, Tsumoto T, Itakura T. Iatrogenic arteriovenous fistula of the middle meningeal artery caused during embolization for meningioma - case report. Neurol Med Chir (Tokyo) 1997;37:677-80. Tsutsumi K, Shiokawa Y, Kubota M, Aoki N, Mizutani H. Postoperative arteriovenous fistula between the middle meningeal artery and the sphenoparietal sinus. Neurosurgery 1990;26:869-71. Tsumoto T, Nakakita K, Hayashi S, Terada T. Bone defect associated with middle meningeal arteriovenous fistula treated by embolization-case report. Neurol Med Chir (Tokyo) 2001;41:42-7. Komiyama M, Yasui T, Tamura K, Nagata Y, Fu Y, Yagura H. Chronic subdural hematoma associated with middle meningeal arteriovenous fistula treated by a combination of embolization and burr hole drainage. Surg Neurol 1994;42:316-9.